Defying Gravity Professor Jenefer Davies talks about her new book on aerial dance and the physical and artistic challenges of working against gravity. What’s the history of aerial dance, and when did you become interested in this art form? Within the larger continuum of dance, aerial is relatively new. It began to make an appearance in the 1970s when dancers started experimenting with the trapeze and other sorts of apparatus that were, at the time, part of circus arts and began incorporating them into dance performances. Prior to teaching at W&L, I was the artistic director of a professional dance company and school. We started experimenting with rope and harness and collaborated with some climbers who had technical expertise in rigging. I was interested in discovering what we could do with rope and harness artistically. The outgrowths of that experimentation were a few really interesting and exciting performances. When I came to W&L in 2006, incorporating aerial dance into our academic curriculum was one of my goals. It was quite a long process of permissions, determining which building on campus would suit our needs, the logistics of rigging to the building and, most of all, ensuring the safety of the dancers. This was a huge undertaking by my department, the dean’s office, the director of health and safety, the director of facilities management and the director of outdoor education, as well as W&L’s architects, engineers and many others. Thanks to all of these people, I taught the first aerial dance class and presented the first aerial production on the outside wall of Wilson Hall during the 2008 spring term. To my knowledge, W&L was one of the first universities in the country to incorporate aerial dance into an academic curriculum. What draws me to modern dance is its philosophy and how that philosophy informs movement. This art form was created by radical, independent women at the turn of the 20th century, and it was created specifically for women’s bodies. There is a feminism present that acknowledges weight and gravity, acknowledges power and isn’t afraid to show exertion in performance. Dancing modern means we can take you on journeys and tell stories through a unique lens. Teaching modern dance technique is one of my favorite classes because I cover both the movement principles and kinesiology of the art form, but I also incorporate some of its philosophy and history. There’s so much more to dance than just moving through space. It’s about acknowledging and understanding why you’re moving through space, where it fits in the historical canon and how it happens kinesthetically. It involves a deep understanding that is more than just shape-making. As an academic, I’ve done a lot of experimenting to determine the limitations and freedoms that are inherent in aerial rope and harness. Refining those outcomes have enabled me to create a program of optimal conditioning for the students so that their bodies were physically prepared before we started working on the wall. Once they are rigged, we use a sequence of lessons to help them grow stronger, flexible, nimble and prepared for performance. Aerial necessitates a very different kind of technique than is required for traditional dance forms. 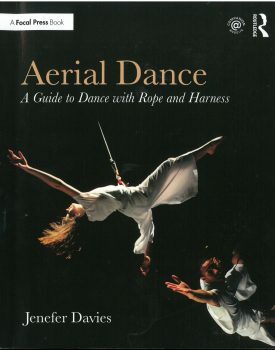 This book describes the technique for aerial dance that I have created (and contains links to companion videos). The book is the culmination of the past 16-plus years of experimentation and research. In some ways, it is really a love letter to W&L. The majority of the research happened during my tenure here. Much of it was supported through W&L grants and through the aid of W&L faculty and staff. All the photos were taken by W&L photographer Kevin Remington, and the photos in the book are all of W&L students who have been in my classes over the past 10 years. I love so much that my students are part of the book. What does it take to train for aerial dance? For much of the time spent on the wall, the dancer is parallel to the ground. Gravity and centrifugal forces work against the body and affect the body in unusual ways. When you are spinning through space or trying to execute a flip, force and direction are upended. Traditional concepts in alignment shift. The cycle of orientation and reorientation becomes an internal conversation. Aerial dance can be difficult for trained dancers because they have set preconceptions about how their body moves through space. Traditional concepts of alignment, the force necessary to push away from the ‘floor,’ distance gained in jumps and leaps, and timing and landing suddenly become uncertain and fluid. Alignment is an internal process of sensing, as opposed to an external use of mirrors. The way that muscles engage, give in to and resist gravity has shifted 90 degrees. You think you know where your body is in space, but your body is not where you think it is. Aerial dance takes everything you thought you knew about your body and shifts it. In addition to the muscles that are working in a new way, part of the training for aerial dance is developing internal kinesthetic knowledge. What do you want your students to learn about dance? One of the things that is wonderful about being an artist and an educator is that my scholarly work and teaching interact and converse with one another. In creating and presenting original pieces of choreography, I contribute to the scholarly canon of dance. When I have the opportunity to also set these works on my students, my scholarly work is translated into teaching. These two aspects intertwine in a really beautiful and harmonious way. Further, many times in the rehearsal process, I receive valuable feedback from the students, which then circles back and informs my scholarly work. It is a wonderful collaborative experience. I hope that all my students, across all the classes I teach, walk away with a sense of bravery. For many of them, dance is new territory. I work to create an environment where students feel safe to take risks. Then I encourage them to try new things, learn from failure and risk again. In many ways, the failing is the succeeding. It’s the learning. There’s a quote I share with my students that says, “The greatest risk is not taking one.” That’s why we’re here — to try new things. Sometimes that involves flying high into the air from the roof of a building.